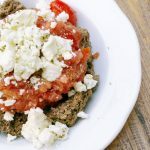 Melitzanosalata, or “Agioritiki” Greek Eggplant Dip , is a simple yet tasty dish, which is really common in the Greek cuisine. It can be perfectly eaten on toasted bread as a spread, or as an appetizer (aka “meze”). It originates from the Mount Athos in Greece, from which it takes its name “Agioritiki” (‘Agion Oros’). Mount Athos is an important center for Eastern Orthodox monasticism and there, are hosted 20 monasteries. All these years, monks have been growing their own goods, and by following their simple lifestyle, they have created recipes based on Greek cuisine, which are really simple and healthy, while using the fresh ingredients they grow. Some may say “Agioritiki” has been defined as a cuisine itself, similar to the Greek one. 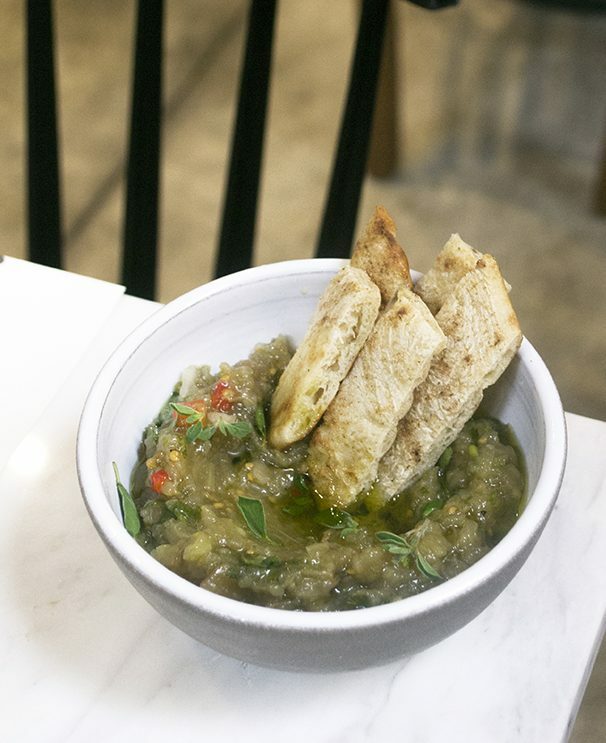 This specific recipe of eggplant dip is super easy to make, because of the ready-to-use roasted eggplants and red peppers that can be used. Otherwise they would need to be roasted and that would take more time. Cut the ERGON roasted red peppers in small pieces and place them in a large bowl with the eggplants and all the other ingredients. If you want your “Melitzanosalata” to have a creamier texture, add the ingredients in a blender and pulse, adding the olive oil gradually. Bake in the oven for 3-5 minutes the pita bread, until it gets a soft golden brown color. Chop the fresh parsley and basil leaves and sprinkle them over the mixture with some olive oil. And ready! In case you don’t have the ready-to-use roasted eggplants and red peppers, you can make them yourself. As for the eggplants, you can roast them whole or sliced. If you decide to roast them whole, make sure you use a fork to make some holes and bake for 1 hour. If you roast them sliced, cut the eggplants in slices and place them on a baking tray, lined with parchment paper. Coat with olive oil, sprinkle with fresh thyme, season with salt and pepper and add 1-2 cloves of garlic. Cover with parchment paper and bake in a preheated oven for 20 minutes, until tender. Your oven should be preheated at 200C. The same goes for the the roasted peppers, but now for 40 minutes. Then you continue with the steps 2-3. Extra tip: Let the eggplant dip to sit for a while! The more the ingredients will blend, the tastier it will be!